Is Humanity Alone in the Universe? Unlikely. The debates about whether sentient life is a unique phenomenon in our universe or not has lasted decades. From dogmatic beliefs about humanity having been created by a deity, public opinion has mostly moved to a more flexible, diverse outlook. Since it became known that there is life out there, experts have mostly debated about the possibility of an intelligent, self-conscious species existing somewhere in space. Some believe if alien life does exist, it is necessarily better developed than humanity. It is supposed to possess a progressive culture, faster-than-light spaceflight secrets, and advanced technologies and weapons. 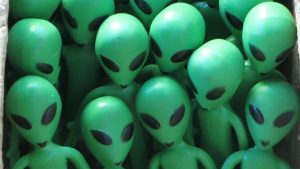 The thought about humanity being inferior to alien species provokes fear, which has been manifested in popular culture for the last hundred years. Others think that even if there is sentient life in space, it does not necessarily outstrip the human race in terms of development. It is possible that such a race would be stuck in its own analog of our medieval epoch, with the most advanced technology in its possession being gunpowder. Or, it could be a race of primitive hunting animals with bows and spears, living in tribes, and dancing around bonfires. Anyways, what matters is that talks about the possibility of intelligent extraterrestrial life moved from “whether” to “how common?” To prove this thesis, let us take a look at the arguments its proponents come forward with. According to one recent study, chances that we are not alone in the universe are significant: approximately one in 10 billion trillion chances. It may look like a ridiculously small possibility, but let us not forget about the number of stars in one galaxy that we live in, or about the number of galaxies in our local galaxy cluster, or about the number of galaxy clusters that exist in the universe. In fact, considering the enormous scales of the world we live in, 10 billion trillion to one does not look insignificant anymore. This proportion was derived based on the famous Drake equation, and implies that advanced extraterrestrial civilizations may not just exist, but could have developed and disappeared before. This is what Adam Frank, the lead author of the study, says: “One in 10 billion trillion is incredibly small. To me, this implies that other intelligent, technology producing species very likely have evolved before us […] Think of it this way. Before our result, you’d be considered a pessimist if you imagined the probability of evolving a civilization on a habitable planet were, say, one in a trillion. But even that guess, one chance in a trillion, implies that what has happened here on Earth with humanity has in fact happened about 10 billion other times over cosmic history, owing to the estimated number of stars and planets in the universe!” (IFL Science). Indeed, we tend to underestimate such seemingly small probabilities, completely forgetting about the fact that in the scales of universe, even one out of 10 billion trillion means an unimaginably huge number of chances. This alone could serve as valid proof for the claim that humanity is not alone in the universe, but there is more to it. Several decades ago, scientists only predicted there could be planets other than Earth that would have conditions suitable for life on them to emerge. However, not so long ago it turned out that there are exoplanets that have conditions almost similar to those that organic life on Earth itself enjoys. In 2014, NASA’s Kepler Space Telescope detected such a planet in the so-called habitable zone of Kepler. Called Kepler-186f, this planet is believed to be just one out of many other similar planets scattered across the galaxy. In fact, some astronomers believe almost every star in the Milky Way has a planet orbiting around it. Considering the statistics mentioned above, it is possible that many of these planets are inhabited, and some could be even home to intelligent alien species. Sara Seager, professor of planetary science and physics at Massachusetts Institute of Technology, says: “Sometime in the near future, people will be able to point to a star and say, ‘that star has a planet like Earth’” (Huffpost). And she is not alone in her claims. Moreover, many scientists are extremely optimistic about unveiling the truth, claiming that in the next decades, we will know for sure we are not alone in space. Charles Bolden, a former astronaut and currently NASA administrator, says: “Do we believe there is life beyond Earth? I would venture to say that most of my colleagues here today say it is improbable that in the limitless vastness of the universe we humans stand alone.” Kevin Hand, NASA astronomer suggesting there already is alien life existing on Europa, one of Jupiter’s moons, is even more specific: “I think in the next 20 years, we will find out we are not alone in the universe” (CBS Connecticut). So far, humanity has no empirical evidence of intelligent alien life existing somewhere in the universe. However, there is strong mathematical proof of such a probability, and there is the experience and knowledge of NASA astronomers who believe life outside Earth exists. Our universe is an incredibly large place. Earth is a tiny hydrogen molecule in the vast ocean of space–and it would be extremely arrogant to think that it is the only place where the miracle of life could have emerged. Carpineti, Alfredo. “We Are Almost Certainly Not Alone In The Universe.” IFLScience, IFLScience, 20 Mar. 2018, www.iflscience.com/space/we-are-probably-not-alone-universe/. Gates, Sara. “NASA Makes Big Prediction About Finding Alien Life.” The Huffington Post, TheHuffingtonPost.com, 16 July 2014, www.huffingtonpost.com/2014/07/15/we-are-not-alone-in-universe-nasa-habitable-planets_n_5588455.html. “NASA: Humans Will Prove ‘We Are Not Alone In The Universe’ Within 20 Years.” CBS Connecticut, CBS Connecticut, 15 July 2014, connecticut.cbslocal.com/2014/07/15/nasa-humans-will-prove-we-are-not-alone-in-the-universe-within-20-years/.